Radius Episode 26: InharmoniCity by U.S.O. Project :: June 2, 3, 9 and 10; 12:00 pm (CST). 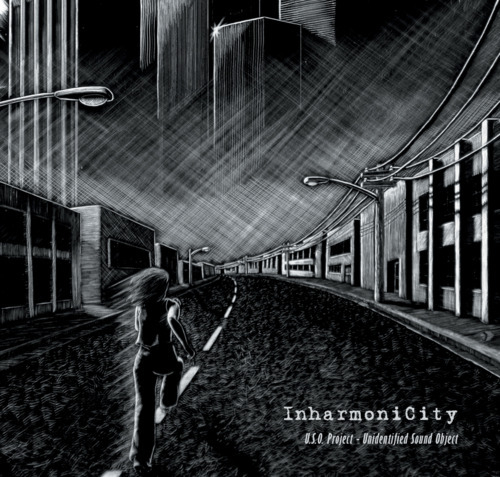 InharmoniCity realizes an urban symphony by using sounds normally hidden from our perception and revealed through unusual transducers. The track Girl Running, establishes a dialogue between the sounds synthesized with Xenakis’ UPIC and the sound outputs of invisible electronic objects. By carrying these magnetic fields into the audible range, the sounds have been suspended, intimately researched, and orchestrated in order to cross the physical borders of aural perception. The goal is to expand the simple concept of presence, a searching for perspective and distance without creating virtual spaces, while pragmatically integrating aural environments in the compositional process. The work is an attempt to recover our capacity of phonetic discrimination, without the fear of looking for the silence around us, avoiding singularities that get lost in an unbalanced aural environment. The imperfections in each sound/noise and the silence, free from any insurgence of distortion, are locked in a conflict of eternal existence and interdependence. Silence not as Emptiness, but as living presence that precedes the life of men and goes further than death. The sonic materials are then played and re-recorded in real environments, not generated through digital reverb devices. This technique, often used by sound designers such as Ben Burtt and Walter Murch, is called “worldizing.” It consists of playing through a speaker the sounds created, and re-recording it with one or more microphones in different locations (garages, churches or other spaces which have interesting aural characteristics). This way, it is possible to realize several effects, i.e. the classic Doppler, by quickly moving the microphone in front of the speaker in order to vary the frequency of the sound wave (to observe this phenomenon directly, simply listen to the different sound frequencies of a siren when it gets close and then far away). In the track Invisible Words, the radio waves make up the sound sources together with sounds generated by an old Olivetti typewriter. These recordings, after being processed using micro-montage techniques, have been presented in different metaphors. The most interesting appears in the final phase, where a quiet stream of structured pulses mimics, in an almost onomatopoeic manner, an attempt to emit a sound/word with a closed mouth; a painful impossible action, almost as if there were invisible words spoken inside the same mouth. U.S.O. Project is Milan/Rome-based Matteo Milani and Federico Placidi, sound artists whose work spans from digital music to electro acoustic improvisation. Milani and Placidi are also the co-founders of the label Synesthesia Recordings, a repository of electroacoustic works. U.S.O. Project was born from the desire to discover new paths and non-linear narrative strategies in both aural and visual domains. The project includes several collaborations with visual artists and performers. U.S.O. is a continuing evolving organism. Radius is administered by Jeff Kolar and edited by Meredith Kooi.